In this topic you will learn how to create collections and select the videos that will be displayed on portal experiences. 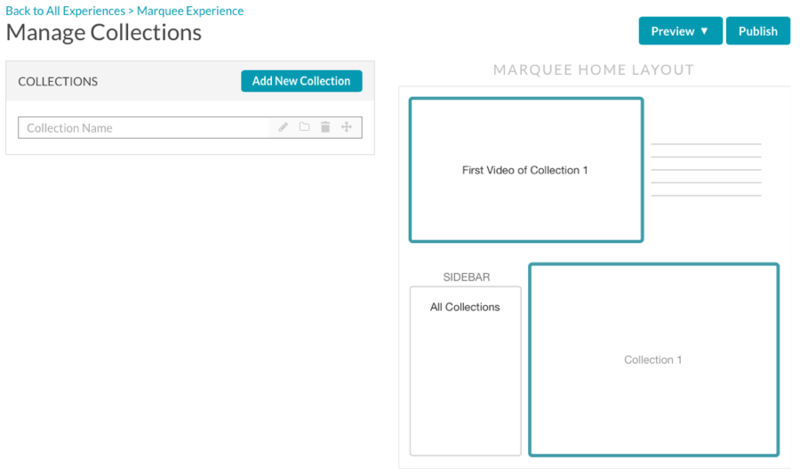 Using the Gallery Collection Editor, you can select the videos to display on portal experiences. With portal experiences, videos are organized into collections. Collections can contain videos from a Video Cloud account or from a YouTube channel. To add videos to a portal experience, click the Videos icon in the left navigation. Click the Videos icon in the left navigation. The Manage Collections page will open. The right side of the dialog displays a preview of the home page video layout for the selected template type. (Optional) To indicate that this is a header collection, click the folder icon ( ). Header collections have no videos associated with them and are used for organization. The Edit Collection page will open. The Edit Collection page is used to add videos to a collection and to configure additional collection properties. The Change Collection dropdown will list all of the collections that have been created. Select the collection to edit. Video Cloud - Video Cloud video content will be used. See Adding Video Cloud Videos to a Portal Experience for information. YouTube - YouTube video content will be used. See Adding YouTube Videos to a Portal Experience for information. Click the Videos icon in the left navigation. Click the Delete icon ( ) associated with the collection. To change the order of how the collections will appear on your site click the Videos icon in the left navigation. Click and drag on the collection name or move icon ( ) and drag the collection to a new position. The separator line indicates if the collections are at the same level or nested. In this example, the Brightcove Player collection is moved to the top. The separator line indicates that all collections are at the same level. Click and drag on the collection name or move icon ( ) and drag the collection to a new position. Dragging to the right will indent the separator line indicating that this collection will be nested. 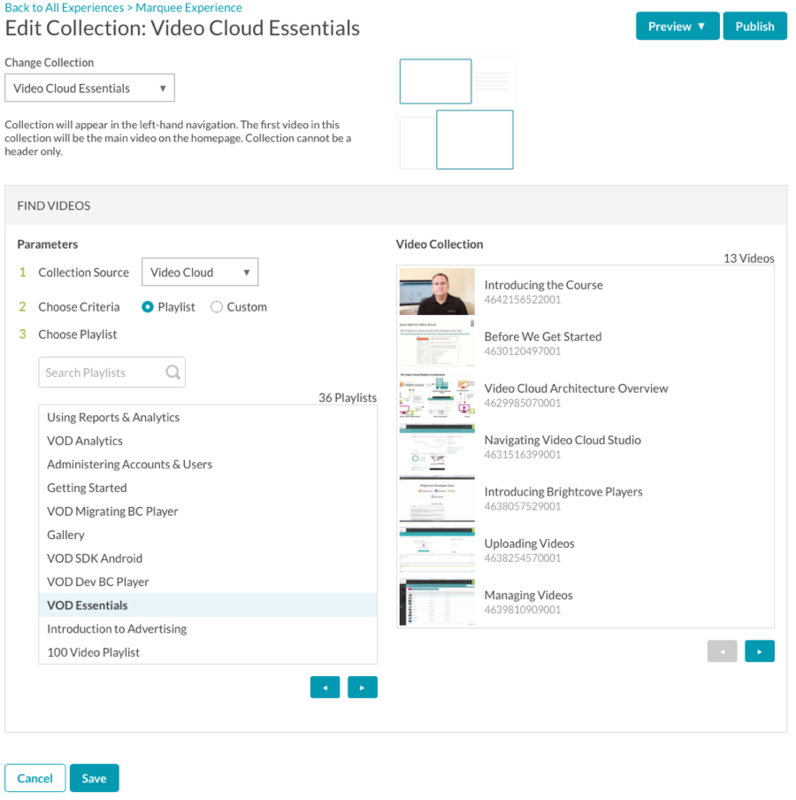 In this example, the Upload Module collection is moved and the separator line indicates that it will be nested under the Video Cloud Studio collection. After the collection is nested, the nesting will be reflected in the Manage Collections dialog. Note: The number of levels that can be nested is based upon the template. The Showcase, Mosaic and Chronicle templates do not support nesting.